Do a chest x-ray . To make sure the tip of the tube is in the right place. Mechanical ventilation. Anaesthesia & Intensive Care website. Available at: http://www.aic.cuhk.edu.hk/web8/mech%20vent%20intro.htm. Accessed August 29, 2018. 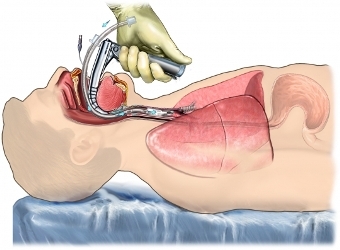 Mechanical ventilation. American Thoracic Society website. Available at: http://www.thoracic.org/patients/patient-resources/resources/mechanical-ventilation.pdf. Accessed August 29, 2018. Explore ventilator/ventilator support. National Heart, Lung, and Blood Institute website. Available at: http://www.nhlbi.nih.gov/health/health-topics/topics/vent. Accessed August 29, 2018.